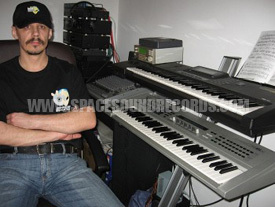 Hello and welcome to Spacesound Records. We would like to shed some light on the individuals who make the music we all love. What better way than hearing it from the artists themselves. Starlight, Welcome to Spacesound! I was born in 1970 in Lublin where I actually live. My zodiac sign is Gemini and my profession is a computer technician. Since my youth I have shown musical ability, I was able to tell the difference in cars by hearing their engine noise. In kindergarden I already was fascinated by musical instruments particularly those that had piano keys. During my school years the accordion became an instrument of interest. I learnt to play many songs by ear. Since the mid 80’s -90 I began organizing discothèques. With the arrival of the first PC computers I began an interest in composing; though my first production was on the Timex. Apart from my Electronic knowledge, the computer was never a main interest; however that changed with arrival of the Atari. The ability that it offered allowed me to uncover its true potential and to maximize it in music. In the early 90’s I bought my first equipment, started doing covers of 60’s 70’s and 80’s. My love and ability for music come from my mother, who sang and played the mandolin in a music group. Since the early years I was exposed to music as there were a few family members who played. My main reason was my uncle who was a multi-instrumentalist and had equipment such as the Weltmeister 60 accordion. His playing inspired me and it was on this instrument that I first started my first notes. Programming and creating webpages. I also like fixing electronic equipment. In my spare time I also enjoy snooker, basketball and ping pong. Firstly and mainly electronic music from the 70’s and 80’s. Apart from this I listen to Classical music as well as Pop, Rock, film music and recently I have been listening to organ music. For many years I’ve had an interest in it. On many Sunday nights I would stay back after Mass in the Cathedral just so I could listen your standard compositions interpreted by (Rudolf Steiner) performed on the pipe organs, piano and cello by very competent musicians. Rudolf Steiner was my piano teacher and I hope one day I will have the opportunity to play pipe organs in church. Yes, under the pseudonym Deep Darkness, I create music somewhere between ambient, ethnic and Berlin School. A sample of my work can be found at the following page http://www.myspace.com/deepdarknessmusic These compositions are part of the project "Contemporary Electronic Soundscapes which features some of Poland’s top Electronic musicians. I came in contact with Spacesynth through Italo. The early 80’s was a period of discovering many different music styles particularly electronic. It all started with the group Space and their hit “Magic Fly” I liked this track so much that I began to look for other songs with a similar atmosphere. I discovered Tangerine Dream, Klaus Schulze, Kraftwerk, Jean Michel Jarre, Mike Oldfield, Vangelis later on I got to know Laserdance, Koto, Hypnosis, Cyber People. The fact that I grew up when Italo Disco was dominant. I took notice of the instrumental versions. Spacesynth showed up being a kind of instrumental discotheque, you had rhythm, melody but more specifically a unique sounding bass sound as well as synth riffs. These features made me more interested in this genre of music and getting to know the albums and artists. I don’t like the repetitive rhythmic sequenced sounds, particularly the bass and percussion which give a specific atmosphere for this genre. By using the same sounds all the tracks sound alike and as a result it becomes boring and off putting. The ability to create different sounds is far greater than 10 years ago therefore we have a lot to choose from. Yes first and foremost Jean Michel Jarre, Mike Oldfield, Kraftwerk, Depeche Mode, Enigma and Deep Forest. After hearing Oxygene and Equinox I have never heard such incredible synth sounds to this day. Blending pop rhythms and plain passages with unique and innovative ones for those times and adding space effects got me interested in synths, their build and how they generate those sounds. In consideration, I would say two: Future Generation and Masterpieces. Even though it has been a while since they were made I still think that they are one of the best in all production of Spacesynth. Here we have the quintessential example of spacesynth at it best created by the differing styles of M. van der Kuy and Anfrando Maiola. Unfortunately, M. van Der Kuy's later Laserdance productions seem to lack catchy moving lead sounds. Of course I would. I am open to all offers. I don’t have any personal preferences. I think here the most important thing is to have honest intentions and willingness to support concrete ideas. Oh Yes. I associate with this music many memories of my school years. I could say a lot. Like now days the prevalent music at discothèques is Trance Techno and House back then in the 80’s the king was Italo. Radio played a lot of this music as well. The fact that I did organize discos during that time gives me a sentimental attachment; I don’t think I’ll ever tire of Italo given the short time that this style existed. To this day I willingly return to listening to Italo and thankfully for the Internet I am able to find material that I’ve never heard before. I never took part in this scene. Probably the reason is that I never had the right equipment when it all started. I’m sure there would have been benefits and experience from it. If you make great music then even with demo you will be noticed and even successful. Examples of this are Lizard King and Chris Huelsbeck whose game music was played by a symphony orchestra. A lot of the time many new songs come about during composing another track. This happens when I’m looking for different sounds/tones, I’m checking the effects. The filters, the generator and usually here I come up with something different, then it’s a matter to decide whether it’s going to be a rhythmic piece or perhaps a slow number. I then add the percussion, bass and melody. Sometimes I compose from the piano sounds and then I work on the different sounds and melodies. I think the importance of the melody is not only fundamental to Spacesynth but to all music. It is the melody that lets you know whether the track is catchy or not, whether it appeals to your ear, or whether it’s monotonous or chaotic. From this basis we form our opinion whether we like it or not. I consider myself somewhere in between. I would describe my music as Soft Space. There are fewer characteristics than classical Spacesynth. It is far more soothing and peaceful but it does retain a specific space character. I try and maintain my own style where I feel most at ease that being experimental with the sounds of different instruments. Now that’s a good question. It’s hard to really say how this genre should broaden. I think both sides have a point. I would opt for the broadening of the genre because you have to realize these are the requirement that the market wants. If we stay with Laserdance’s influence then we are closing our doors to broad appeal and only limiting ourselves to a small group of spacesynth fans. Today Electronic music is vast with many genres; it probably has evolved more than any other type of music with the inception of the Midi interface in 1983. With software and hardware being more accessible due to price drops I think this topic warrants much further discussion on the forums. This is a hard guess and it’s difficult to come up with a constructive answer particularly given that there is a lot of music available freely. Since the early 90’s when electronic dance music began to evolve with technology and pick up tempo, it then became mainstream. It's hard to put on a brave face with what we hear on the radio and clubs. Today music is flooded with Homies wearing caps backwards or hoods making weird hand signals trying articulate incomprehensible phrases mixed with boring sounds. A lot of professional musicians probably consider how to not be a part of such pop culture yet reach out to the mainstream. I think to gain mass appeal we need to try and make a Trance version or Techno version and promote this in clubs and discos and media. That’s what is happening in Germany. Maybe then we will have a road to success. I have pretty humble equipment. For production I make use of Yamaha CS6X with the plug-in PLG150-AN EMU Proteus 2000, Roland JD-990, JV-1080 with extensions SR-JV80-99, SR-JV80-15, SR-JV80-04, Oberheim Matrix 1000, Korg Wavestation SR and other VST plug-ins. On the market there are many synthesizer products that are comparable to the hardware when it comes to the palette of sounds. I think that this is a good alternative, being more economical as well as cheaper. At times it is hard to say whether it was a pluggin or hardware. The negatives are the impact on the CPU and its usage, thus the need for more powerful CPU’s becomes necessary to ensure there are no crashes. This happens when one uses too many pluggins at once. One of the positives is that it doesn’t take up space on ones desk. I don’t have a preference as I don’t watch much TV. I wish all fans and myself that this music may continue to grow and gain more appeal. I also would like to hear some feedback on my material. Greetings to all. 1. Tea or Coffee? Green Tea. 2. Market or Shopping Mall? Market, but it depends on ones needs at the time. 4. TV or Sport? Sport and more Sport. 7. Summer or Winter? Thinking... Winter. 9. Beer, wine or Spirits? Beer, but wine for dinner. 10. Blonde or Brunette? Brunette.